The Bhopal Gas Tragedy—not the 1984 one but the 2010 repeat—had everything going for it to be quickly consigned to the deepest crevices of our consciousness. A ridiculously long overdue verdict, a farcical sentence, poor (mostly Muslim) victims in a non-metropolitan city, the short memory of the public. And then the fact that 1984 happened before the era of satellite TV. “Will media activism secure justice for Bhopal?” was, therefore, a question well worth asking on 8 June, after Judgment Day saw the eight accused get a comical two-year term (with a proviso for immediate bail) for killing 15,274 and maiming 574,000 people 25 years and six months earlier. Would the media go hyper like it had done for Aarushi, Jessica and Ruchika, was a doubt on many a cynic’s lip. To its redounding credit, it has. The Bhopal issue has had an incredible run over the last two weeks, each day unravelling new and unknown facts and facets of the complicity of politicians, bureacurats, diplomats, industrialists—all those who allowed the tragedy to happen, all those who let the killers to run away, all those who want us to forgive some and forget the rest. The media is often accused of lacking stamina and hunting in a pack. But for once, print and television—and indeed online—rose to the challenge, in India and the United States. And if the prime minister has had to constitute a group of ministers, the other reason is media pressure; the main reason of course is obvious. The grid above gives a sampling of the vast array of people the media tapped over the last 12 days. Quotes, photographs, videos, official documents, CIA reports, newspaper clippings have all been unearthed to get to the bottom of the story and piece together the jigsaw. So much so that former Union Carbide chief Warren Anderson‘s house was staked, and his wife was interviewed at her doorstep. The media hasn’t done a favour to the nation, of course, but a service that is expected of it. But in the ocean of cynicism that surrounds the media—of political patronage, ideological bias, paid news, corruption, etc— surely there is no harm in saluting a passing island? This entry was posted in Issues and Ideas, Media and tagged Aarushi Talwar, Bhopal Gas Tragedy, Churumuri, Jessica Lal, Ruchika Girhotra, Sans Serif, Warren Anderson. Bookmark the permalink. This is a case of media patting its own back for something that ought to have been done 25 years ago. One only wishes the media especially ELM shows the same level of enthusiasm and commitment in exposing the Indian counterparts of Anderson viz., Keshub Mahindra and his cronies. 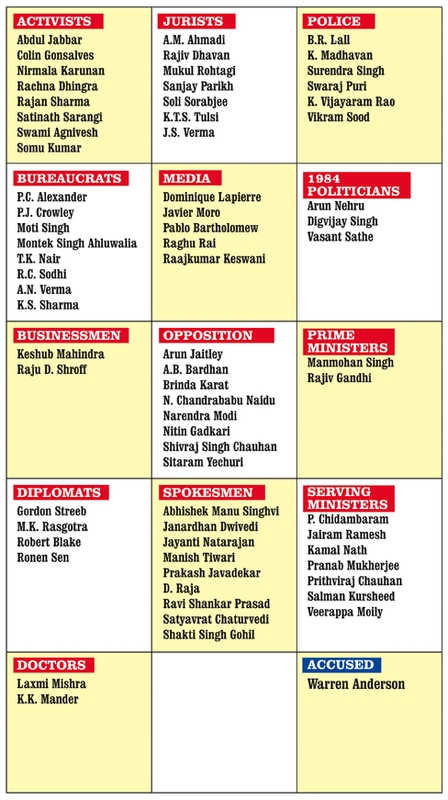 The lone name Warren Anders in the accused column gives away the game media is trying to play in shielding the Union Carbide bigwigs from India, who still can be booked and put behind bars. It is a myth that Media only cares about rich man’s issues. It cares about any item that may shock or move the TRPs, and typically they happen to target Middleclass and above (especially english media). Bhopal affected poor and rich equally. I personally know a very wealthy Family from Bhopal. The family sensed something was wrong and fled to gwaliar on the day, but not before the lady of the house got affected by the gas. She suffers to this day with neurological disorders. Bhopal case is shocking, because it shows us how insensitive and valueless Congress has been to human life. Ofcourse media will take up this issue, because it extends the same theme of lack of justice in our society – for Rich or poor. A driver was Killed in Anil Nanda residence and IBN channel is making hue and cry about police inaction. I am sure rest will join in if Police sleep further. You left out Abhishek Manu Singhvi! Mr. Singhvi is one of Dow Chemical’s counsel and contends publicly(not just in courts) that Dow Chemicals has nothing to do with this “incident”! How can an official spokesperson of a political party air a contradictory view than his party’s official stance!? If congress cares anything about propriety and discipline, it should fire him as their official spokesperson. There is a mistake, the column Accused should include the name of Rajiv Ghandy! It is very obvious that Rajiv will get away, we will see what the MEDIA can do about this. Unfortunately it is not MODI who was the PM in 1984 for the MEDIA to bash! Soeey, dear Churumuri, but India’s media, generally, deserve no thanks; they have been, in their respective turns, responsible for all of the injustices associated with the Bhopal gas tragedy. Two weeks of activist coverage cannot repair a generation of ineptness — heck, forget about fair coverage, most newsrooms in India have neither a full-time fact-checker (and no, copy editors do not perform that job) nor are educated in the culture/history of the communities they cover. Except for a handful, India’s self-righteous and often verbose journalists reflect the same flaws they criticize in politicians/bureaucrats. I can give many many examples, but that would be redundant to anyone like me, who daily consumes all — yes, all — major Indian newspapers and television channels. regularly. Media is the only hope for India. It is good to see finally free speech getting its roots in strictly regimented Indian society. Hooray to Indian media.. Hooray to churumuri. haha..now one ex-secy dude is saying it was Narasimha Rao who let off Anderson. Congress can go to any length to protect Rajiv Gandhi. What is your take on this? Who do you think let off Anderson? Rajiv Gandhi? Arjun Singh? PVN? MMS? Mallikarjun Kharge? Sangh Parivar? Since most of the victims were Muslims as Churumuri informs us, surely Sangh hand cannot be ruled out? What about Mossad or CIA? Why mention the religion of the victims? Different religion would have made them lesser victims? Ahh what a juvenile claim, who talked to Late Shri Rajiv Gandhi? 50% the people media tapped are professional windbags. BTW, Mr Rasgotra may finally get some opportunity to occupy a Raj Bhavan. When you are getting paid top dollars, your paymasters have every right to expect certain SLAs. Congratulations!! you have successfully confused the whole nation again. Agreed media did play a good rule.. but your article says “A ridiculously long overdue verdict, a farcical sentence, poor (mostly Muslim) victims in a non-metropolitan city, the short memory of the public”… why bring in religion for the victims? let us say mostly poor who died. I could not see Manyasri Arjun Singhji’s good name anywhere on the il-lustrious board? Has Churumuri absolved him? Or is it a case of selective amnesia? //The media hasn’t done a favour to the nation, of course, but a service that is expected of it. But in the ocean of cynicism that surrounds the media—of political patronage, ideological bias, paid news, corruption, etc— surely there is no harm in saluting a passing island?// I agree. Sure, we should also thank the Government for getting us that 470 million from UCC, not to mention the judiciary for handing out those two year suspended sentences, and wait, before I forget it, all those smart, thoughtful people who still haven’t figured out how to prevent another Bhopal from happening. Bravo all of you, bravo. Impressive list! I looked over several times but did not see the names of any victims, prominent lawyers representing the victims, actual workers from the company or safety experts telling us how this could be avoided. Is this just me? Perhaps, these persons are considered the least important of all. Or maybe the blank column was meant for them? TNIE has put it succinctly:’Who did’nt help Carbide?’ The Congress felt cornered and went on giving one ridiculous reason or the other from Law and Order problem to systemic failure until Rasgotra, the then foreign Secretary put the records straight(?) saying giving Anderson free passage was the right thing to do. Rajiv Gandhi who was apprised by the Home Minister Narasimha Rao who took the decision concurred on giving the free passage. The recommendation of giving fre passage to Anderson by Rasgotra whom US Charge-de-Affairs met apparently was acted upon. Though Rasgotra could not be sure all indications are that the US President Ronald Regan must have phoned Rajiv. The most relieved person appeared to be our CNN-IBN man Rajdeep Sardesai who was nearly ecstatic that after all Congress has really nothing to be defensive about for everything is neatly explained. If only our redoubtable Manish Tiwary knew about what Rasgotra said he would not have backed out from appearing before Karan Thapar, The Devils Advocate. Now the GOM can be relieved for their mandate is only about compensation and they need not deal with free passage or even extraditing Anderson. These are minor details in the scheme of things. Tehelka has done a good piece on Bhopal. I have updated my list of questions to Justice Ahmadi. He can answer to these in any forum he desires..if he invokes contempt of court we will ask the same questions when standing in the box!!! Hope that box is big enough to hold all the citizens of India who are asking the same questions :-). 1) Justice Ahmadi still compares this to a car accident. Refer to his confusing talk that he can not hold owner responsible for an accident driver committed. How did he know who was the driver here even without hearing. UCC held majority share in UCIL so in effect UCC was the driver.. how did he miss it? 2) Or did he go by UCC’s contention that UCIL was a complete indigenous entity hence owner can not be held vicariously liable for operators error. If this was his thinking, he has a much serious explanation to provide. Wasn’t esteemed judge aware of tort law and couldn’t he have asked the plaintiff to file under tort law, if esteemed judge felt that Factory act 1948 was inadequate to the complexities of this case? b) At that time antidote information for MIC was available with UCC but UCC did not provide that information to Bhopal doctors for fear of being held criminally responsible if true nature of this gas was made evident to public. c) The plant had storage tanks for MIC with no refrigeration which was clearly a design flaw UCC forced on UCIL. the list can go on like that. Why did Justice overlook other acts of negligence and went only by that single event of gas leak as the cause of death of thousands. Gas leak was culmination. There was definitely criminally culpable incidents before and after the gas leak.. How come Justice ignored everything else!!! We may even give benefit of doubt to UCC management for events before the leak.. But how you can not initiate action on UCC’s US management for hiding details and antidote for the gas leak? Aren’t justice supposed to go into those questions? 4) UCC wanted case to be fought in India because it would provide opportunity to develop tort law in India? Wasn’t justice aware of this information? What did justice do to apply tort law in this case? What did Justice Ahmadi do to improve justice in this case. He emphasized working in the system. Was Justice Ahmadi unaware of that famous guideline for judges to go beyond what is presented to seek real justice? 6) What does Justice think about BP’s surrender to US government with a promise to pay upwards of 20 billion USD for deepwater horizon leak. Here it was a contractor for BP who was drilling that well. How did vicarious liability got established here. All this happened within months of leak and not decades as Justice Ahmadi’s faith system could have provided. Why should I still trust that faith system Justice Ahmadi was genuflecting against. What is wrong with Indian judiciary? 7) When UCC did not appear in front of magistrate and became a proclaimed absconder chief magistrate had attached its property in 1992. Shamefully Justice Ahmadi as CJI overturned this decision and allowed sale of UCC’s equity to McLeod Russell. What the rational here. Wasn’t this sale amount to tampering of evidence in a crime scene investigation? 8. Justice Ahmadi may claim that he was trying to help the victims of gas leak by collecting the proceeds from above shareholdings into a trust for Bhopal Gas victims. However this trust is owned by Justice Ahmadi himself and ownership goes to his family after his death. What kind of joke did justice Ahmadi play here. How come he thinks that he can do the role of executive in a democratic country while being head of judiciary. Is’nt this a clear overstepping beyond his constitutional role possibly with personal gains? 9) Ahmadi says he had realized now that the ownership of that trust was wrong thing and he wants to relinquish control of the trust and he has been writing to CJIs who came after him for them to take control of the trust!!! Does’nt Justice know it is illegal to hold executive position while one is in judiciary and probably no other CJI followed him wanted to head that trust!! Why did’nt Justice Ahmadi realize this? Two birds with one stone… Clear Rajiv. Smear PVN. Surely, that ex-secy is going to go places :) but his nose is going to be very brown. Add Arun Jaitley to the list, I just learnt he’s also a counsel of Dow Chemicals and has cleverly abstained from participating in any of these debates. Leader of the Opposition in the House of Wise, please step down from that post and resume your profession, you will be at least well paid for your flexible beliefs and ideals. >How did he know who was the driver here even without hearing. Mr. Ahmadi isn’t entirely wrong. Mr. Anderson wasn’t an Indian resident director of Bhopal plant. He perhaps had a moral responsibility and civil liability. He would have a criminal liability only if he knew a disaster would happen and did nothing about it. Indian prosecutors did not present any evidence before the court to prove the US CEO of carbide knew of such a possibility and ignored it. How will a judge hold someone criminally liable, when he wasn’t? Let us consider this – It is a fair analogy to make with a car accident (Though an insensitive one). A owner is not culpable criminally unless If one can prove owner knew the car didn’t have breaks and the break failure was cause of accident. Mr. Anderson can’t be prosecuted criminally for just being the CEO of a company. If that was permitted, then President of India will have to be criminally prosecuted for death of many in a railway accident!! I agree with you. Justice Ahmadi interpreted the law to give more benefit of doubt to Mr Anderson without actual trial!!! My question is how did justice Ahmadi conclude so fast ( within days) on that petition which took CBI 9 long years to investigate and petition. It is not that Indian prosecutors did not provide evidence. Justice did not allow any evidence to be presented before he made that change from 304(ii) to 304A. I suggest he should have even tried hearing the case for violation under 307 in addition t o 304(ii). Furthermore, I recently came across some judgments in court where even traffic accidents have been booked under 304 (ii) when accused tried to “hit and run”. Isn’t Mr Anderson still on the run? In that sense shouldn’t this be under 304(ii) by courts own historical judgments? Jailing of CEOs happens all the time. It is professional risk for taking home millions.!!! CEOs have been jailed in US for fruad, financial misrepresentation, bribary, building code violations, environment pollution and so on, even when CEOs claimed that they were not aware that a crime was being committed by their company. In India we need to advance law to make these interpretations and not constrain ourselves to “work in the system”. In US nobody questions culpability of CEO if a company is caught in a crime. That is why BP readily succumbed to US demands. That is why UCC did not want case to be heard in US and got it shifted to India with active cooperation of then India government and then went absconding. Why should the media be thanked? For not doing its duty for 26 long years? Year after year, it ignored the issue, it failed to uncover the unsavoury facts which are now tumbling out. Once when I wished to place an article on the condition of the children of the Bhopal victims who were born after the gas leak, a senior editor of a national paper told me that there was Bhopal fatigue! All I can say that the media in India gets fatigued really fast. When it should be tracking and exposing the corrupt, it slows down and forgets the issue. Let us face it – the India media chose to forget Bhopal. If it had not, we would not have got this verdict. The victims would have been better compensated, the waste at the site would not be lying seeping poison into land and water, we would have had a stringent policy in place where the polluter pays. And there would have been guaranteed treatment for the yet-to-be born who would suffer the effects of the leak decades later. Instead we have this terrible mess and leaders who can conveniently shut out the cries of thousands of affected. This is going to be the media’s test case – When the judiciary fails, when governments fail to act, will the media wake up after 26 years and act.